Welcome to B & B, at the Au Gué de la Vesle. .
To welcome you on the road to your vacation, discover the Champagne- Ardenne for a family reunion , we have created 3 guest rooms with air conditioning and labélisées 3 suns France B & B in a quiet close in our extensive property Courtisols just minutes from Chalons en Champagne . The private bathrooms are equipped with shower and CALYPSO FLAMENCO and a bath FAUSTINE . For breakfast at the French that are served at the time you want , enjoy breads, brioche and jams made ​​by us. In addition to the tranquility of a country estate at Au ué de la Vesle you have free Wi Fi broadband , computer , indoor and outdoor spaces for relaxation (billiards , table , porch, barbecue, fully equipped cottage , sun loungers) , a cot , a space equipped for meals , bike loan, large park and garden to stroll or park your vehicles or carriages , and your pet is accepted. 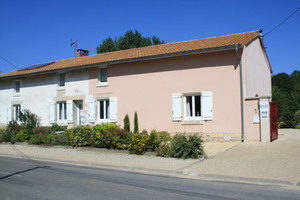 All services and facilities ( doctors, shops , banks, restaurants , garages ) are available by Au Gué de la Vesle Courtisols . You like sports: The paths for the flower walk, 18 hole golf course or track ULM Courtisols await you. The rink or pool at Chalons. To see Courtisols: His 3 listed churches and the Basilica of the Spine (World Heritage Site by UNESCO). In the area: The town of Chalons with listed churches, his boat trip on the Mau and the NAU, half-timbered houses etc. ... Reims, the city of coronations Epernay with its champagne cellars and exposure of the Lightning (capacity of 17000 liters of Champagne) Museums and historical sites in memory of the Great War. R & D 3 from Chalons en Champagne, facing the Basilica of the l'Epine take the RD 65 on the right, about 4 km to reach 153 Ford Street, the guest rooms of the Au Gué de la Vesle.